If you buy cheap, you get cheap. Interesting, the fork on my Scattante (purchased in July or August of 2009) broke at the same place. The strap for my NiteRider battery didn't hold the battery well enough that the battery fell into the front wheel (at 32 MPH). Although the battery pack ceased to be functional, its damage was relatively minor. Some of the inner layers of carbon in the fork hadn't been saturated with epoxy. The manager at Performance made a lot of phone calls, and was unable to hear of any others that had failed from what should have been a minor problem. 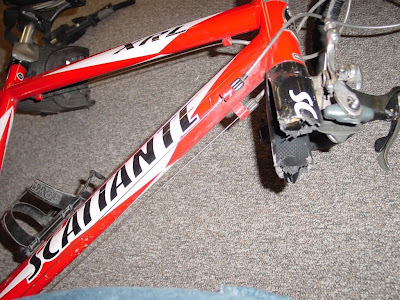 Pictures came from a 2007 review of a Scattante bike. ive seen the same failures on other "american" bikes such as trek, nothing about "buying cheap". 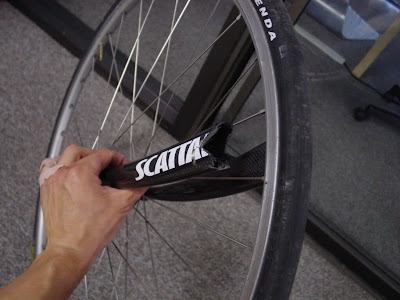 it fails like that because thats wear the aluminum steerer tube ends. the stresses from a collision going that fast would destroy any carbon fork.